Last year was the first time Molly Jo Rose and Sarah Bieber ran in Fort4Fitness. Thanks to a random act of kindness of one stranger, it turned into one of the most memorable races they’ve ever participated in. Neither Molly Jo nor Sarah are from Fort Wayne, but Molly Jo lives here now. She enlisted her niece, Sarah from Michigan, to run in 2017. They both run and train, but nothing could have prepared them for their first ever Fort4Fitness. 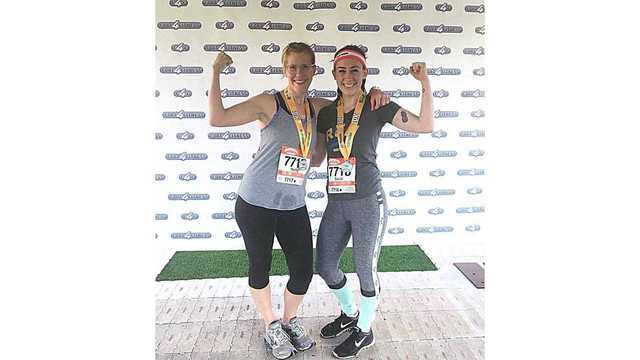 As Molly Jo was running, with Sarah behind, she noticed a sign that said, “You can do this Sarah Rose.” At the time, Rose was Sarah’s last name. Molly Jo asked the stranger if they knew Sarah, and they said “no,” and they just picked a random name off a list of runners. Neither could believe it, and started crying in the middle of the race. They didn’t get a chance to snap a picture of the sign, but are thankful for the kindness of the stranger. “I mean, I don't think those people could possibly know how much that meant to us. We just told that story over and over,” says Molly Jo. "If he could pick a name every year, and make that person feel as special as I did, I would totally recommend it,” says Sarah. Sarah has since been married, hence the name change, and won’t be able to participate in Fort4Fitness in 2018. She and Molly Jo both say they plan to run together next year.